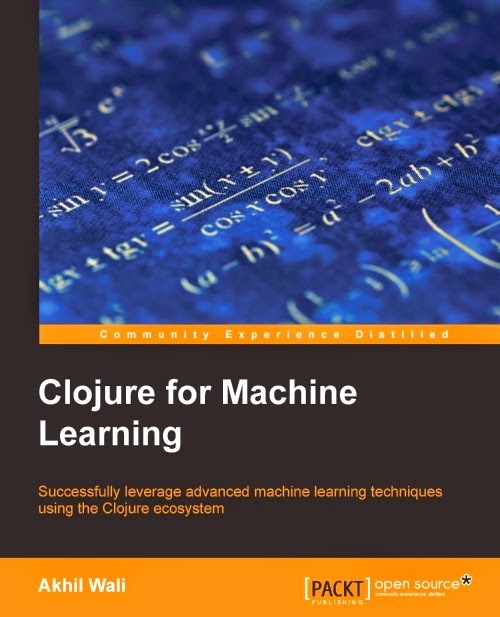 Please keep in mind that Clojure for Machine Learning is not a best choice to learn Clojure, it expects you to know basic constructs. Moreover Clojure code was not always perfectly idiomatic. Using + 1 rather than inc function, nesting of functions instead of composing or threading (-> macro) them, abuse of atoms to introduce mutability or usingreduce instead of conceptually simpler apply + to add up vector of numbers. In one place we see sorting just to take first element – where simply taking minimum would be enough, cutting running time from O(nlogn) to O(n). However author does a good job explaining the code and in general it is quite pleasant to read. Many examples are written on top of ml-clj library, sometimes spiced with Incanter for visualization. But when the algorithm is not very complex, author implements it from scratch in plain Clojure. I found that really enjoyable.